EverGreen Farm 2011 CSA memberships are now available for purchase. The cost for a 2011 membership will remain at $550. A minimum payment of $200 will reserve your membership. All final payments are due by April 1, 2011. 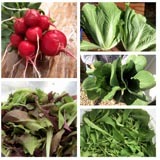 Our goal for the 2011 CSA season is to begin delivering produce the first week of May and go through the end of October. You will receive at least 20 deliveries of fresh produce over this 26-week period. For more detailed information about EverGreen Farm and how our CSA operates, please refer to our 2011 CSA Sign-up Form, the many entries on this website, or contact us directly. Download a copy of our 2011 CSA Sign-up Form (below). Read it carefully. Enclose your partial or full payment and mail in your paperwork. We also have an EverGreen Farm Workshare Program for people who are interested in working on our farm in lieu of paying for a CSA membership. This is for folks who enjoy gardening and will literally work for food. If you are interested, please read over the contract and submit according to instructions. Please let us know if you have any problems downloading this paperwork. I will post a notice on this website when memberships are sold out. Any late sign-ups will be returned. 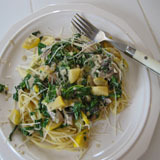 If you would like to pay for your CSA share with a debit or credit card, I can make the arrangements through PayPal. Please contact me individually.